An innovative project from the University of Plymouth has been selected as one of six across Europe to win state-of-the-art robots from global electronics company, Epson. The only UK winner in the company’s inaugural Win-A-Robot competition, the project will see the University receive a series of Epson VT6L robots which will then be used for both research and teaching. It will explore how the technology could benefit the cross-disciplinary intersections between robotics and design, and introduce undergraduate and postgraduate students from both disciplines to the latest cutting edge technology. It will also involve small firms to examine ways to overcome the challenges they face in introducing robots into their business models. The project is being coordinated by Dr Alejandro Veliz Reyes, from the School of Art Design and Architecture, and Dr Mario Gianni and Dr Martin Stoelen from the School of Computing, Electronics and Mathematics. It also involves an industrial collaborator, Plympton-based Artemis Optical Ltd in the creation of a sustainable and adaptable work cell. The academic programme aims to develop new teaching activities and research opportunities in the Science, Technology, Engineering, Arts and Mathematics (STEAM) disciplines. These will include developing creative and technological skills in our students through project-based learning, enabling them to engage with cutting-edge industry challenge in the fields of design, manufacturing and robotics. These activities will exploit the cutting-edge facilities offered by the University and the product testing area of Artemis Optical Ltd, with undergraduate and postgraduate students working on the design, implementation and validation of a sustainable work cell. Ultimately, the project aims to facilitate sustainable partnerships with local SMEs through existing networks, with a focus on sustainability, environmental solutions and social impact and skills. The judging panel included representatives from the fields of policy, industry and academia and took taking note of the strength of each application against criteria of innovation, education, skills development, sustainability and unique robot usage. 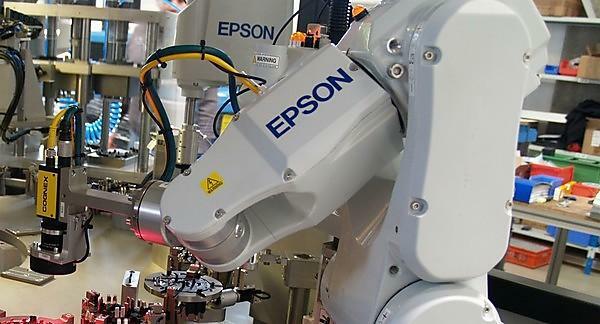 Over the coming months, Epson Europe and its partners will work closely with the institutions, providing support and training to ensure the winning teams and wider student body are able to get the best use from their robot.